I received product for review from Wild Republic. The opinions within this post are of my own and I was not influenced in any way. Please do your own research before purchasing products or using services. Your opinions and results may differ. For nearly four decades, Wild Republic’s realistic stuffed animals and toys have helped children explore the beauty of nature. Their mission is to create toys that foster curiosity about wildlife and educate children about the wonders of nature. I love that the company features animals that you don't necessarily see for sale at other places. I recently received one of the Wild Republic Huggers for review. Huggers are soft, stuffed animals with snap bands as hands. By spreading their arms wide and squeezing their chest, the Huggers plush will instantly wrap their arms around you. There are many Wild Republic Huggers animals, with some of them being a sea turtle, unicorn, red monkey, snowy owl, and emperor penguin. I received the Ice Blue Penguin. It certainly is an adorable little critter. If you're familiar with slap bracelets, the arms of the plush animals are like those. Wild Republic Huggers can be used in many ways. They can be worn around your wrist, attached to a backpack, or wrapped around a piece of decor. 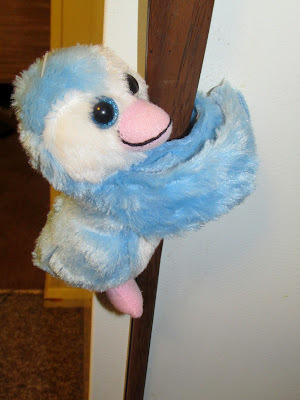 Our blue penguin has made its way around the handle of the fridge and greets us every time we open the door. One person will win a Wild Republic Huggers plush. I really like the teddy bears. They are so cute. I would have to say my favorite is the African Leopard. Such a beautiful animal! I like giraffes and dolphins. My favorites are pikas and otters. My favorite is the Snowy Owl. I love watching prairie dogs at the zoo! My favorite animal are lions! Wolves are my favorite animal. I love to hear them howl. My favorite animal is the Panda they are so cute! Dogs are my favorite. My favorite wild animal is the giraffe. I love tigers and lions. Aww, these are cute! I love the panda! It's a difficult question to answer! I have many favorite non-domestic (and non-lab) animals. I don't know if I can pick just one. My favorite mammal is perhaps the tiger. They are extremely beautiful and powerful, and I'm attracted to their fierce self-confidence. Lions are my favorite animal. I love English Bulldogs and llamas. Monkeys are my favorite animal. I love lions & tigers! i like frogs and kitties. That's a hard question and can change often. At the moment, I like squirrels. Right now my fat orange cat named Cheeto is my favorite animal because he is keeping my feet warm. I lover the elephant toy the best. My granddaughter loves elephants. It is the only animal noise she makes every time she sees it. Huggers Kangaroo Stuffed Animal - 8" would be a top pick. dogs are my favorite animal. i love them. I love zebras, they are just so beautiful. My favorite animal is the black bear. I like squirrels and chipmunks. The panda is my favorite animal. Dogs are my favorite animal. My favorite animals are pigs. I also really elephants and zebras. I love cats, monkeys, and pandas. My favorite animal is the koala bear. My favorite animal is the koala. Gorillas are our favorite animals. My favorite animals are felines. I think tigers are cool. I love the Five-lined Skink Stuffed Animal - 12".